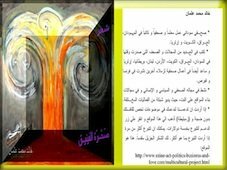 HOAs Arabic Prose is a Bilingual Space for Writers from the Horn of Africa! Use HOAs Arabic Prose to Read and Write In Arabic! 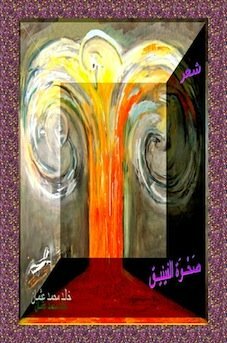 The HOAs Arabic prose is a bilingual website in Arabic for Arabic writers from the Horn of Africa, supported by English prose and prose in other languages. It is the Arabic HOA part of the HOA's Cultural Project and the main category of the Arabic HOA Political Scene. 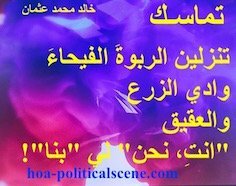 hoa-politicalscene.com/hoas-arabic-prose.html - HOAs Arabic Prose: A quote in Arabic about dilapidation by poet, critic & journalist Khalid Mohammed Osman on Thompson Twins, Tin Tin Adventures. The cultural project starts from within the HOA's Comprehensive Projects and it includes the HOA's Journalists Project and the HOA's Poets Project. Each of these projects is supported by some monetizing methods at the HOA's Journalists, the HOA's Poets and the HOA's Poets Bookshop to fundraise our cultural project and award some writers. This means all of these projects on the HOA Index, whether Bilingual HOA, or English HOA are supported by some stores and other products to fund the activities we run here, since that costs a lot of money. The intention is to support contributors too, when that becomes available and when they continue to support the Horn Africa's Network. So, take some steps to write in Arabic here, using the form on the HOAs Arabic Prose page below. Apply some experiments with this and be active. 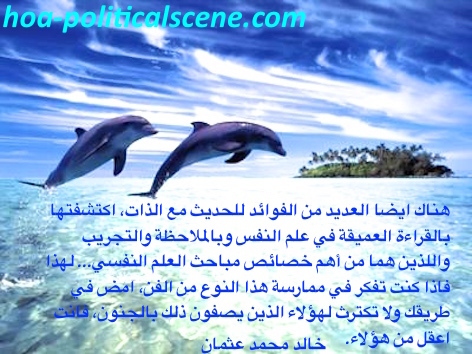 hoa-politicalscene.com/hoas-arabic-prose.html - HOAs Arabic Prose: A quote in Arabic about dilapidation by poet, critic & journalist Khalid Mohammed Osman on dolphin playing on beautiful sea. حسنا، لابد انك تعلم ان من يفعل ذلك لابد ان يكون قد أصيب بمس من الجنون، لذلك فانت او اي شخص اخر في عالمنا يخشي ان يصيبه ذلك المس او ان يصفه الاخرون بالجنون. لكن الحقيقة هي غير ذلك... فقد أثبتت دراسات حديثة في علم النفس ان التحدث مع النفس امر طبيعي و علاجي في نفس الوقت. بل ذهبت هذه الدراسات الي ان مخاطبة النفس عبر الحديث الشخصي الذاتي يؤدي الي نوعية مميزة من العمل الابداعي بالاضافة الي ما يتيحه ذلك من مجال للتنفيس الذاتي عن الغضب و انفعالات اخري عديدة تظل مكبوتة عند الغالبية الصامتة من جماهير عالمنا الذي يحافظ علي طبائعه حتي اذا كانت بعض تلك الطبائع تسهم في تخلفه المزمن. ان للحديث مع الذات جوانب ايجابية عديدة منها بالاضافة الي الترويح عن الذات و فض الهموم المكبوتة و تبديد المخاوف المجهولة، منها ما يعرفه عالم الاداب و الفنون بالتداعي الذي يوصف بمرحلة المخاط (مثل الذي يصيب الحوامل) و الذي يسبق ميلاد العمل الابداعي. و منها ايضا اكتشاف نقاط الضعف الذاتي و بالتالي العمل علي معالجتها. و منها ما يتعلق بتأكيد الذات بمرونة و من غير اي حب سلبي للذات يسلبها خصائص التوازن و التعقل و نكران الذات. 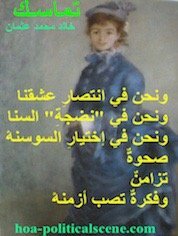 و منها التلقين الذاتي و الحفظ و الاستذكار و تجويد اللغة. هناك ايضا العديد من الفوائد للحديث مع الذات، اكتشفتها بالقراءة العميقة في علم النفس و بالملاحظة و التجريب و اللذين هما من أهم خصائص مباحث العلم النفسي... لهذا فاذا كنت تفكر في ممارسة هذا النوع من الفن، امض في طريقك و لا تكترس لهؤلاء الذين يصفون ذلك بالجنون، فانت اعقل من هؤلاء. هناك مراجع كثيرة في هاتين الصفحتين تؤدي الي فهم متكامل للعديد من جوانب علم النفس منها ما كتبته بقلمي و منها ما قرأته، و هي في مجملها تعطي دروسا عديدة لبناء الشخصية القادرة التي تستمد قدرتها من يقين المعرفة الازلي (قصدت ان اقول ينبوع الا ان يقين سبقت ذلك و الشكر موصول للتداعي العقلي و حركة الاصابع علي الكي بورد) و حتي الشخصية الكاريزما. 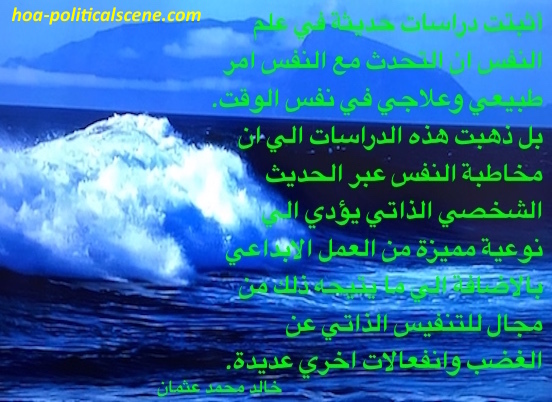 hoa-politicalscene.com/hoas-arabic-prose.html - HOAs Arabic Prose: A quote in Arabic about dilapidation by poet, critic & journalist Khalid Mohammed Osman on beautiful blue sea. Use the small buttons you see on the HOA Political Scene to tweet, like, or share the HOAs Arabic Prose with your social media services. Thanks. Have comments on the HOA's Arabic Prose? Enter your comments on the HOAs Arabic Prose in the big box, write a headline, provide your name and email address and then submit the comments. Your email is secure and the system will only use it to send you notifications when somebody comments on your entries into the HOAs Arabic Prose. Enter your comments on the HOAs Arabic Prose in the big box, write a headline, provide your name and email address and then submit the comments. Your email is secure and the system will only use it to send you notifications when somebody comments on your entries into the HOAs Arabic Prose. Comment C2 Entries on the HOAs Arabic Prose appear at the second section of the page above. 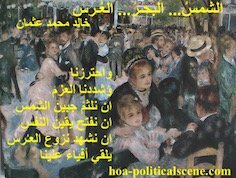 If you have not commented yet on the HOAs Arabic Prose, please do that now before you visit any other page in Arabic. I use the strong website building and optimizing tools you see on the image below to empower the HOAs Arabic Prose and the entire network of the HOA Political Scene Blog.